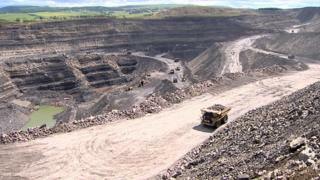 The company that runs most of Scotland's remaining opencast coal mines is to half its output next year. Hargreaves Services said it was losing money on some Scottish operations due to falling prices and "exceptionally challenging" market conditions. But it said it remained committed to Scotland and expected that the market should recover. It is simplifying its management structure and cutting fixed costs in the face of "extreme volatility". The price of coal last month fell to a nine-year low of £39 per tonne. That is £16 lower than the price when the company acquired its Scottish surface mines in spring of 2013. With gas prices down, it said there was "a significant and unexpected reduction in coal burn by UK power stations" and the ability to predict future demand was "very poor". Hargreaves expects demand from the power sector to fall and said it was possible that some power stations would buy no more coal this calendar year while they were burning through existing stocks. While coal-burning power stations are scheduled for closure, it is expected before then that demand for British-mined coal was likely to fall faster than demand for imports. The company's main rival in Britain, UK Coal, is cutting prices following the mild winter, while the remaining deep coal mines are boosting production. "Notwithstanding this sharp fall in coal price, we remain committed to Scottish surface mining but will have to significantly reduce next year's planned 2m-tonne production target to mitigate losses," the company said, in its update for the stock exchange. "We are currently targeting around 1m tonnes of production in the year ending 31 May 2016 focussing on the contribution from higher-priced speciality coals." The problems at the Scottish opencast sites were expected to have "an impact of £8m", said Hargreaves, and jobs were expected to go. The company, which also runs coal-mining operations in England and Wales, reported revenue down 24% in the six months to 30 November. Profit before tax on its continuing operations was down 49% to £15m. It claimed to have delivered "a resilient performance in difficult markets" and substantially reduced its debt. Hargreaves chairman Tim Ross said: "The market conditions we are currently experiencing are unprecedented and very challenging. "Although we are unable to control factors such as coal price and coal demand, the management team is proactively taking all the sensible steps and measures to manage current market conditions whilst leaving the group well placed to benefit when the market improves." Hargreaves is expanding renewable energy generation on its land, having recently secured planning permission for a wind farm in South Lanarkshire. Shares fell 11% to 505 pence following publication of the six-month figures, down from 892p last March.